One of the offshoots of globalisation has been the massive growth registered by the literature industry. Since 1991 the country has seen an unprecedented increase in the number of novelists, short story writers, poets and historians coming out with their works accompanied by a kind of advertising blitzkrieg. The country which, till then, had witnessed very few Indian writers in English publishing their works once in a blue moon began experiencing a plethora of writers flooding the markets with all kinds of literary works. Every third person you met in the book houses and libraries even in small towns turned out to be writers — internationally acclaimed writers if the blurbs on their works are to be believed. Mulk Raj Anand, Raja Rao, RK Narayan ended up as ‘pass’ for the new breed of writers. For the first time in my life, I heard the new gen critics scoffing Ramayana and Mahabharata as pulp. For the GenNext writers, the great Indian epics were exaggerated accounts of events which occurred in the reactionary minds of some monks or sanyasins. They ignored the fact that the works featured places, people, environment, ecology and universal laws about love, kindness, truth and humanity. Hence, we started getting exposed to poetry, stories and short stories that lacked a sense of natural flow. Writers confined to their royally furnished studios and study rooms started writing about poverty, drought and of course universal brotherhood and civil rights. The problem was that they moulded stories out of the lives of poor farmers, labourers and craftsmen about whom they had only read news reports. This was in stark contrast to what the great novelists and short story writers of yore years stood for. “Do you want to write novels or short stories? Learn life first. Experience the hardships of reality. Never go by the accounts by a third person. You travel, watch places and people, speak to them, live with them and then you will get first-hand information of what is life,” said P Kesavadev, the eternal rebel of Malayalam literature who wrote path-breaking books like Ayalkkar (The Neighbours), Odayil Ninnu (From a Drainage; 1942), Adhikaram (1968) etc. Odayil Ninnu is the first ever novel in South India which told the story of the downtrodden and that too in their style. No wonder, more than seven decades after its publication, it continues to be the most sought novel in Malayalam and has been shot into films in three or four languages. Dev’s words still echo all over the literary world. Those who followed his style and way of thinking ended up writing some of the all-time bests among novels and stories. The names of R K Narayan, Raja Rao, Mulk Raj Anand and Sarat Chandra Chatterjee became synonymous with the best of novels. Devdas, a character created by Chatterjee is a universal icon because the readers could identify themselves with him. They could also easily identify with RK Narayan’s fictitious small town of Malgudi and its residents because it was just like the towns in which they grew up and all the characters in it were just like their own friends and acquaintances. There were several novels written by Indians writing in English but most of them did not have the kind of quality and stickability that one would have liked for them to have. They did not stand the test of time. Readers were often drawn to them more because of scarcity of better options than anything else. Well, a major source of relief for such readers has been offered by Adithi Rao, through her pioneering work Left From The Nameless Shop. Her book is a collection of stories (of course inter-connected) centred around Rudrapura, a small time town in Karnataka. Rao has created Rudrapura and its local residents in the style of Malgudi. But the similarity ends there. Each character is different from the ones created by Narayan though there is an intangible link which brings them together. While the painter Devendrappa paints the images of reel-life characters on his canvass to be installed as a hoarding on the first floor balcony of the mansion in the own, Rao has picturised the life of Rudrapura community on her canvas and that too with élan. 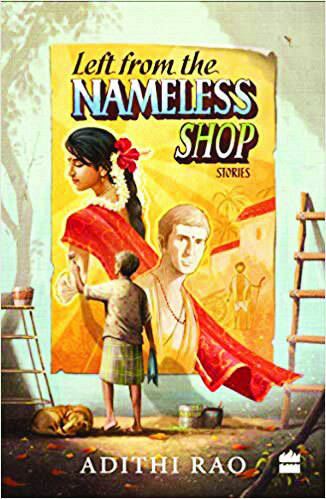 Left From The Nameless Shop relates stories of the local population of Rudrapura. What makes the book a memorable one is the honesty with which the author has portrayed them. Narayan could write about Malgudi’s happiness, sorrow and disappointments because he was the resident of such an unnamed town and had gained first-hand knowledge about the people living there. Adithi, too, seems to have experienced the same and it has helped her in portraying characters like Devendrappa, Narayanamma, Basavaraj, Raghuvir Dixit and others. These seem like real people to the readers. They do not come across as strangers because their dreams and disappointments are very lifelike. Adithi Rao has been successful in delving into their lives and bringing out the goodness in their hearts. The disappointment Devendrappa faces when he loses his job as a painter in the cinema talkies has been written in a way that is bound to get the reader to feel sad for the character just like one would feel for a friend or relative. Narayanamma’s anxiety and stress as he struggles to emerge as a supplier of ice cream to a city-based shop is palpable even through just words. The author brings out the unquenchable thirst in Dixit’s heart for the love of a woman. There’s no judgment or bias against him based on the fact that he is not quite interested in getting married. She makes the character human, fallible, and adorable. And, she does it with ease and poise. What makes Rao stand out in a crowd of younger writers is her capability to tell the stories in an inimitable style dear to serious readers. It is impressive because it reminds readers of writers of the calibre of RK Narayan and Mulk Raj Anand. Rao introduces herself as a writer of stories and spinner of yarns, but this young author is a master craftswoman. Her portrayal of emotions and events is both engaging and enlightening.